Material handling system plays an important role in improved material flow and increasing production performance in the readymade garment industry. If you ever visited a garment factory, you might have seen various kind of material handling equipment used by them. In this post I’ll be discussing different types of material handling systems found in the readymade garment industry. At the time of new garment factory set up or improvising production system and factory layout, material handling system is taken into account for better factory performance and smooth material flow. A right material handling system across the factory departments reduces material transportation time, waiting time at work and delays. The means used for transporting work (like fabrics, cuttings, bundles, finished garments and general items) from one place to another, storing materials and protecting material from damage, are called material handling system. It may be an equipment, device or procedures. For better material handling, equipment are engineered according work place design. As said above there are different type materials handling systems based on process requirement. Whether it is a new setup or an existing setup, factories have many options for choosing one out of available material handling. Common material handling systems found garment manufacturing units are listed here. Cutting department is responsible for cutting garment patterns/component from the fabric rolls. Cutting department has to handle lot of fabrics and cutting bundles. So they need material handling tool and equipment like these. Trolleys: For transporting fabric from fabric store to cutting section. Forklifts are also used for this purpose. Plastic trays and trolleys: Cut pieces are placed on treys. 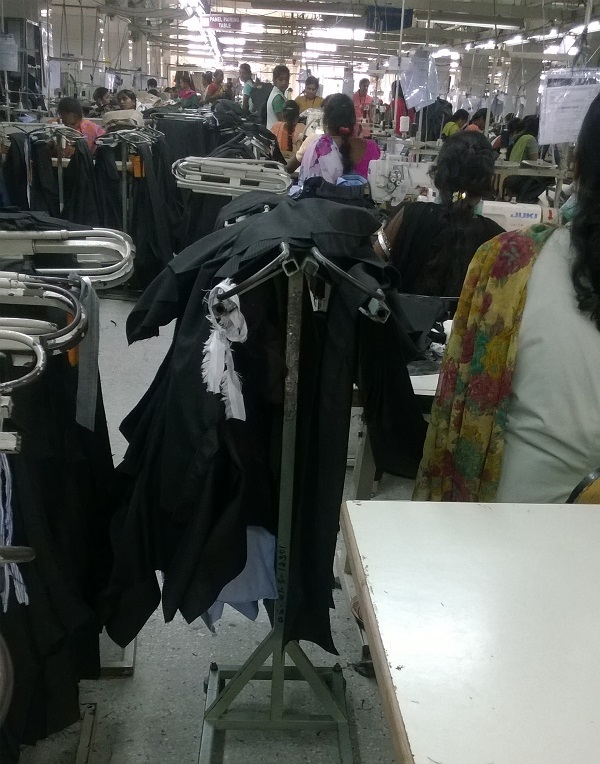 Trays filled with garment with certain number of pieces are placed in trolley. Fabric Bags: Cuttings are bagged into fabric bags or plastic bag and carried out to production section manually. Racks: Racks used for storing cutting bundles (WIP). 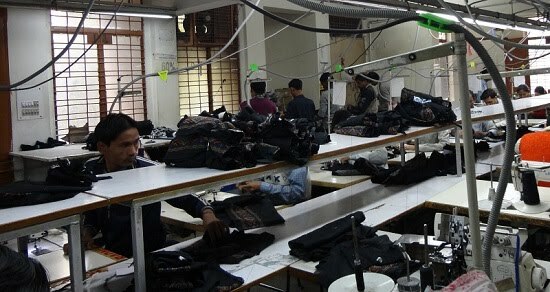 Garment stitching department does stitching of garments from fabric (cuttings). Different types of line layout for stitching line are found in the garment industry. Based on the production line layout, material handling system is designed. In stitching department material handling system is needed for transporting bundles from one workstation to next workstation, and for storing WIP. Conventional side table (with bin): A side bench or a side table is placed for loading cuttings and disposing stitched garments. This kind of layout is normally found in group production system and make-through production system. Centre table: Centre table is the most common material handling system used in the production line (progressive bundle system and single piece production system). A bench (2-1.5 ft wide) is placed in between two rows of machines. See following images. 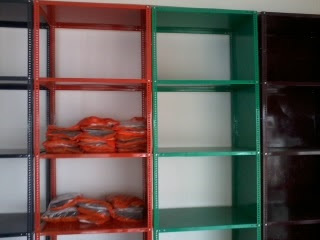 Plastic crates and Bins: Bins are used for disposing stitched garments. Plastic bins are used for transporting garments from one place to another. Overhead production system (unit production system): Many production units use overhead rail and hanger for transporting material. Factories found it is easy to track WIP on the UPS system. Some factories experience issue in line balancing. 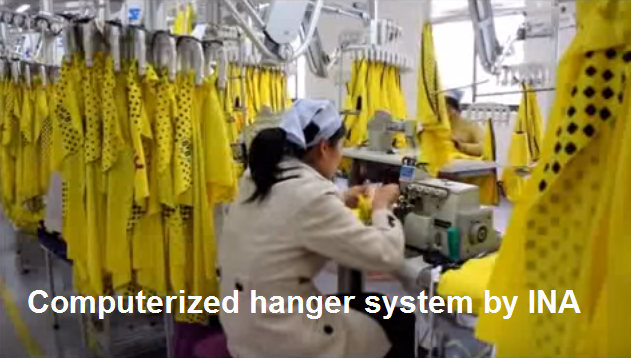 Different types of overhead hanger system are available. 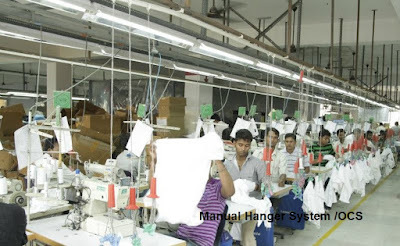 Example of manual hanger system and computerized hanger systems are shown in following images. Also See: 3 different automatic overhead systems for apparel manufacturing. 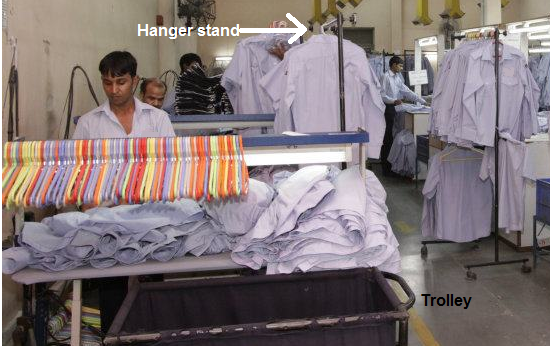 Trolleys: Transporting garments from one workstation to another workstation. Hangers and stand: Sometimes garments are not folded and shipped in full length in hangers. Pressed garments are hanged on hangers and stored in a stand. Material handling systems, material handling equipment, need of those various kind of material handling in the garment production.